The kinetics of spermatogenesis are the temporal relationships among the various germ cells within the seminiferous epithelium as they proceed through mitosis, meiosis, and spermiogenesis (13,16,17,20,21). The Sertoli cells, the only somatic cells found in the seminiferous epithelium, provide nourishment, growth factors, and organization to the germ cells (14). These somatic cells span the entire seminiferous epithelium, sitting on the basement membrane and stretching to the lumen of the seminiferous tubule. The seminiferous epithelium has, in addition to the Sertoli cells, one or two types of sper-matogonia, spermatocytes, and spermatids. The spermatogonia lie on the basement membrane and, as described previously, are mitotically active. The spermatocytes, produced by the cell division of the last generation of differentiated spermatogonia, move toward the lumen of the tubule and, thus, constitute the next layer of the epithelium. The spermatocytes complete meiosis and produce the spermatids. The spermatids form the layers of the epithelium adjacent to the tubular lumen and proceed through the steps of spermiogenesis. The arrangement of the germ cells and the synchrony of the three processes of spermatogenesis, mitosis, meiosis, and spermiogenesis, result in a limited number of cell associations of fixed cellular composition (see Fig. 1). The steps of spermiogenesis define a finite number of cellular associations, usually 12 in nonhuman primates, and 6 in humans (16,17,20,21). The cellular associations are temporally related and form a sequence called the cycle of the seminiferous epithelium. Each cellular association is one stage of the cycle. The cycle of the seminiferous epithelium is defined as the occurrence of all stages in sequence in one area of a seminiferous tubule. In higher primates, the area of the seminiferous tubule in one stage of the cycle encompasses from 0.1 to 9 mm of the length of a seminiferous tubule, except in humans (20-21). The duration of the cycle can be determined by administering a labeled nucleotide that is incorporated by all cells that are synthesizing DNA in preparation for mitosis. By precisely timing the interval between the administration of the labeled nucleotide and the removal of the testis, the duration of the cycle of the seminiferous epithelium can be studied. In addition, the frequency with which a stage is detected is directly related to the duration of that stage. Using the duration of the cycle and the individual stage frequencies, the duration of each stage can be determined. In turn, the duration of spermatogenesis can be estimated from the duration of each stage. The difficulty of determining the length of spermatogenesis results, in part, from the lack of consensus of when spermatogenesis precisely begins (see Stem Cell Renewal). In many higher primate species, a single cellular association forms the epithelium of a segment of the seminiferous tubule (20,21). However, the seminiferous epithelium of man does not follow this orderly pattern (16,17). In humans (21) and in two other primates, an Old-World monkey, the olive baboon, P. anubis (27), and a New-World monkey, the common marmoset, Callithrix jacchus (28), a cross-section of a tubule may contain more than one cellular association. 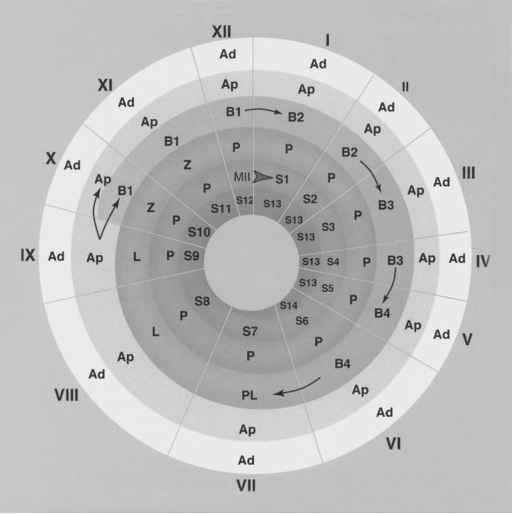 The duration of the cycle has been determined in several nonhuman primates to range from 9 to 12 d and is characteristic of each species (13). To gain this information, the radionucleotide, tritiated thymidine, was administered to adult male primates. Testes were removed within 2-3 h after the injection. Other testes were removed at carefully timed intervals after radionucleotide administration. Using the most mature labeled cell at each interval, as well as stage frequencies, the duration of the cycle was determined. For example, tritiated thymidine was administered to several adult male stump-tailed macaques, M. arctoides, and the most mature labeled cells were determined in testes removed either 3 h or 12 d, 3 h later (20). Using the stage frequencies that are directly related to the individual durations of each cycle stage, and the percentage of germ cells labeled at each time point, the duration of the stump-tailed macaque cycle was determined to be 11.5 d.
As stated previously, the seminiferous epithelium of man is less well organized than is that of other nonhuman primates. More than one cellular association may occur in a cross-section of the seminiferous tubule, and, frequently, some cellular associations are incomplete because one or more generations of germ cells may be absent. For these reasons, analysis of the kinetics of spermatogenesis in humans is problematic. Nonetheless, Heller and Clermont (17) were permitted in the early 1960s to inject tritiated thymidine into the testes of prisoner volunteers. Biopsies of the testes were performed 1 h, 16 d, and 32 d after the injection. In the biopsies performed at 1 h, the most mature germ cells were preleptotene sper-matocytes in Stage 3 of the six stages identified in man. At 16 d, pachytene spermatocytes in Stage 3 were the most mature germ cells labeled. At 32 d, after the administration of labeled nucleotide, Step 3 spermatids were the most mature germ cells labeled. From these results, the duration of the cycle in man was estimated to be 16 d. Spermatogenesis was defined to begin with the production of type B spermatogonia and extended for four cycles, or 64 d. Although this study will not be repeated for ethical reasons, it should be noted that biopsies are of limited value in a study of the kinetics of spermatogenesis. They are not representative of the entire testis, because too few seminiferous tubules are sampled to allow for a meaningful description of the cellular associations, their individual frequencies, and a sample that is sufficiently large to permit assessment of the percentage of each type of germ cell that incorporated the labeled nucleotide. All of these parameters are necessary to estimate the duration of the cycle of the seminiferous epithelium and, in turn, the duration of spermatogenesis. For these reasons, estimates of the kinetics of spermatogenesis of man that were reported in this early study must be considered preliminary (17).